With CDC reports showing chemical bed bug treatments are causing human illness, even death, the ThermaPure Heat Process Co-invented by David Hedman is gaining traction in the war on bed bugs. Here are 10 tips to keep yourself safe from Bed Bugs! A mother trying to kill bed bugs in her Fort McMurray apartment used an imported pesticide that fatally poisoned her infant and left her other children critically ill. The substance used in the apartment was a pellet form of phosphine, an agricultural pesticide that is strictly controlled in Canada and requires special training to use. When exposed to the air, the pellets react with moisture and release phosphine gas, said James Kehrer, a toxicologist at the University of Alberta. As a gas, it’s often used to fumigate large batches of grain. Can Bed Bug Traps Clear An Infestation? Over the past few weeks, you may have noticed a flurry of headlines about a revolutionary new bed bug trap, which its inventors claim will put a big dent in bed bug infestations. So, does this new contraption truly mean the end of bed bugs? Short answer: probably not. Long answer: read on. The new bed bug trap comes from researchers at Simon Fraser University, and it published in Agewandte Chemie, International Edition in late December. We’ve been trying to build bed bug traps for centuries. But what the SFU researchers have done is add a new twist. According to a new study published on Monday, bed bugs are capable of transmitting a parasite that causes Chagas disease, an infection that in some cases can lead to cardiac or intestinal complications. The infection is found most commonly in Mexico, Central American and South America, but has been increasing its foothold in the U.S.
“There are a lot of people with Chagas disease, and a lot of bed bugs. They are in our houses, in our beds — and in high numbers,” said Michael Levy, a researcher at University of Pennsylvania’s Perelman School of Medicine and senior author on the new paper. 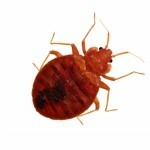 He also co-authored a report in January that found bed bug populations in Philadelphia are growing by 70 percent a year. SEATTLE — It’s safe to say bedbugs are some of the creepiest, crawliest, skin-tingliest insects on the planet. And if you don’t like creepy, you’ll want to stay away from Chicago. The Windy City ranked highest among Orkin’s list of Bedbug Cities for all of last year, meaning more homes and apartments were treated for be bugs in Chicago than any other city in the country. Chicago’s problem is so bad, the city council passed an ordinance requiring condo associations to have a formal management plan in place for detection and treatment of the pests. Seattle ranked number 18 on the list, dropping five spots from the previous year. Surprisingly, Seattle is only one spot behind New York City, a notorious center to one of the nation’s worst pests. Employees at United Airlines’ Chicago headquarters are experiencing this firsthand, USA Today reports. Though the insects haven’t been found on the carrier’s planes, they have been found on the 16th floor of the Willis Tower, where the airline is based. United has confirmed that the parasites have indeed been found. A group of Penn State entomologists working on a bio-pesticide for locusts and houseflies has found its product also works on bedbugs. That discovery was honored when the Ben Franklin Technology Partners awarded ConidioTec — the group that developed the pesticide — its $25,000 Big Idea prize at the Chamber of Business and Industry of Centre County awards gala in March. Now, the pesticide is in the process of being registered with the federal Environmental Protection Agency. When approved, it will be on the market for licensed pesticide distributors. It will not be available to the general public. Bedbugs hitching rides in books? Yep, and it’s happening here. A New York Times piece about bedbugs and other crawly creatures showing up in library books says the problem is occurring across the country — including at the University of Washington. The article quotes Stephanie Lamson, head of preservation services at the University of Washington Libraries, saying she has put bug-infested books in plastic bags and then into freezers to kill the critters. This brief video serves as an intro for the full length Animal Planet special entitled Bed Bug Apocalypse. Find out more about what experts are calling an epidemic of national proportion that is happening around us. Watch the whole video here! 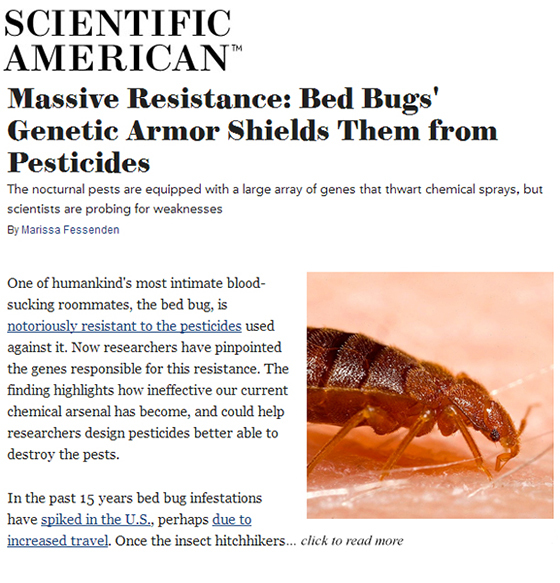 Natural Pesticides for Bed Bug Control: Do They Work? Researchers at Rutgers University tested nine commonly available biopesticides against a field strain of bed bugs. In recent years, there has been a movement of “green pest management,” focused on the use of natural and low-toxicity materials instead of conventional synthetic insecticides. 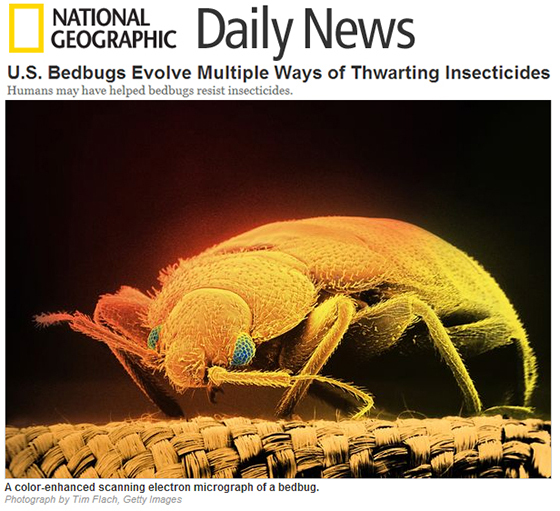 The resurgence of bed bugs further bolstered enthusiasm for natural products. In particular, essential oil-based pesticides, referred to in this article as biopesticides, flourished in the consumer market. Recently, the Federal Trade Commission filed deceptive advertising charges against two companies marketing allegedly unproven natural bed bug treatment products. Yet, many similar products remain on the market. Some of these products cost $50 to $100 per gallon. Do these products work? 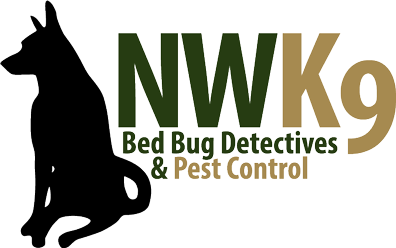 The new 2013 Bugs Without Borders Survey conducted by the National Pest Management Association (NPMA) and the University of Kentucky, found that bed bug infestations in the United States continue at high rates and the pest is as much, if not more of a problem than in years past. The survey of U.S. pest management professionals, found that 99.6 percent of respondents encountered bed bug infestations in the past year and that infestations have increased. Although bed bugs have in the past been typically associated with residential environments, these hard to control pests become even more challenging when they infest commercial facilities. 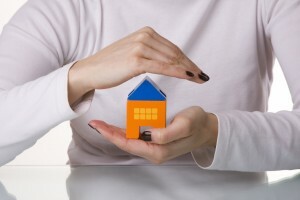 Due in part to the large size of most facilities, as well as the numerous hiding places such structures offer bed bugs, management of this pest can be extremely difficult. From dawn to dusk, bed bugs remain mostly in their harborages. Understanding their movements after the lights go out can provide useful insights in respect to monitoring and management. Like cryptic “couch potatoes,” bed bugs lead rather sedentary lives — at least during the daytime, when inspections and treatments are typically performed. Drawn by aggregating pheromones, bed bug nymphs and adults spend most of their time clustered in hidden harborages where mating, egg-laying, hatching, molting, digestion and defecation occur. They venture out in search of blood when hungry, and typically at night. Bedbugs are a growing public health issue in the United States and around the world, but their resurgence in recent years may have been aided by humans who unwittingly helped the pests evolve numerous ways of thwarting a common insecticide, scientists say. 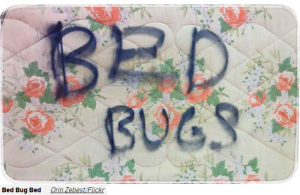 In a new study published online today in Scientific Reports, researchers examined the genes of bedbugs from different U.S. cities and found that several of the populations had multiple means of resisting a class of insecticides called pyrethroids.